Club Kart is a Go Kart racing game from Sega. The DX cabinet features a 50 inch screen, and the seat is fashioned like a real life Go Kart. Go Karts hit the track, travelling at 100km per hour around many tracks like the streets of Piazza Laziale. Each machine comes with a card reader that allows the player the customise they kart including name, kart body and frame colour, helmet and racing suit. This information is stored of each players personalised "Club Kart Card". This card also enables the player to enter the Championship race, which allows the player to gradually rise up the ranks from Novice class, all the way to S class. Club Kart-European Session features twelve exotic locations from Southern France, Spain and Italy, with scenery like ancient roman ruins, expansive Mediterranean beaches, and treacherous mountain switchbacks. A first place assures your advancement to the next course, and if you manage to successfully complete a series of races over fifty authentic companies will want to sponsor you and your kart. The company supply their company logo to affix to your kart, and Club Kart includes some of the worlds most successful and recognizable companies which add to the games realism. Club Kart is a Go Kart racing game from Sega. The DX cabinet features a 50 inch screen, and the seat is fashioned like a real life Go Kart. Go Karts hit the track, travelling at 100km per hour around many tracks like the streets of Piazza Laziale. 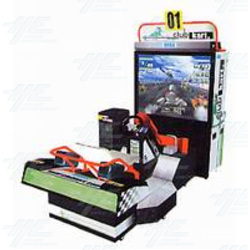 Each machine comes with a card reader that allows the player the customise they kart including name, kart body and frame colour, helmet and racing suit. This information is stored of each players personalised "Club Kart Card". This card also enables the player to enter the Championship race, which allows the player to gradually rise up the ranks from Novice class, all the way to S class. Club Kart-European Session features twelve exotic locations from Southern France, Spain and Italy, with scenery like ancient roman ruins, expansive Mediterranean beaches, and treacherous mountain switchbacks. A first place assures your advancement to the next course, and if you manage to successfully complete a series of races over fifty authentic companies will want to sponsor you and your kart. The company supply their company logo to affix to your kart, and Club Kart includes some of the worlds most successful and recognizable companies which add to the games realism.